UPGRADED! 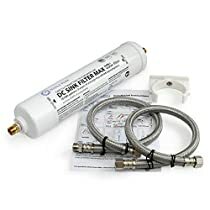 Ultra High Capacity, Premium Under Sink Direct Connect Water Filter (10,000 gallons/THREE YEARS) by Nahla Pure. Removes 99.99% of Contaminants for Great Tasting Water. Made in the USA. Please note this filter does not filter out fluoride. We all want to be healthy and we know we should be drinking more water but worrying about changing your water filter every 2-6 months is not only a hassle but EXPENSIVE! Unfiltered tap water can taste a bit funny, but it's what you can't see or taste that you worry about. Bottled water costs more but we know the risks of BPA in plastic and we know the waste isn't good for the environment! 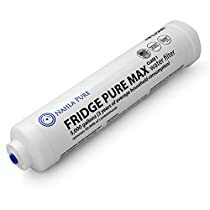 IF ONLY THERE WERE A WAY TO TURN MUNICIPAL WATER INTO GREAT TASTING, PURE WATER... Nahla Pure's DC Under the Sink Water Filter MAX is JUST THAT! Don't just take our word for it. Dr. Susanne Bennett, DC, CCSP states: "American water fails to meet public health goals, and water pollution law enforcement is unacceptably low. These countless microorganisms and toxins in tap water can contribute to allergy symptoms and disease. Removing these chemicals from your drinking water will significantly reduce your internal toxic load and may improve your body's natural ability to deal with allergy symptoms." We at Nahla Pure understand how important your health is. We have worked hard to provide the best filter on the market to quench your thirst for water that helps CONTROL CALORIES, ENERGIZE MUSCLES, IMPROVE SKIN, PREVENT CONSTIPATION as well as other health benefits you already know. Nahla Pure's DC Sink Filter MAX replaces the need for specialty water faucets or space hogging water pitchers! DC Sink Filter MAX doesn't need to be replaced for 10,000 gallons or THREE YEARS! DC Sink Filter MAX removes 99.99% of all contaminants - no more bad tastes or odors, no volatile organic compounds (VOCs), chlorine, lead and other heavy metals. Buying DC Sink Filter MAX is buying peace of mind and great tasting water! PROUDLY MADE IN THE USA. Don't wait any longer. BUY NOW! ULTRA HIGH CAPACITY. Lasts 18X longer than the standard pitcher filter - 10,000 gal / 3 years. REMOVES CLUTTER. Under the sink wall mounted filter system frees space from your fridge and counter. DIRECT CONNECT TO STANDARD 3/8" COLD WATER LINE. Enjoy clean, fresh water directly from your faucet. Better water right from your tap! PROUDLY MADE IN THE USA. Also proud supporters of the Water School USA. SATISFACTION GUARANTEED. Click the "ADD TO CART" button to Buy NOW! 100% Money Back Guarantee. 64 of 67 people found the following review helpful. Honest review. Installation and water quality test results. First off, I'm writing this review in exchange for a discount I received on this item. This by no means swayed my opinion of the filter. So, I received the filter about as nicely packed as a plastic cartridge and a couple of hoses need to be packed. In a cardboard box. When you buy this kit you'll get the filter, a mounting clamp with a screw to hold the clamp in place, a couple of supply hoses and a brass fitting to adapt your existing sink hose to one of the new hoses. Installation was straight forward and can be completed with a couple of crescent wrenches and a #2 phillips screwdriver. Locate your COLD WATER valve under your sink and shut it off. Unless they're labeled, run both the hot and cold water in your sink and feel for which is which. I accidentally hooked the filter up to the hot side, which I fixed after realizing my mistake. Disconnect the supply hose from the valve. Connect that hose to the brass fitting that came with one of the filter's new hoses and hook all that up to the filter's outlet. Now connect the other hose that came with the filter between the valve and the filter cartridge. Mount the plastic clamp to the side of your cabinet somewhere with the included screw and snap the filter in place. Turn the water shutoff valve back on and that's it. 10 minutes and I was done. While I consider myself fairly mechanically inclined, I believe the average person can do this in about 20 minutes. After installation I ran the cold water through the Nahla filter for about 5 minutes to ensure that I'd be getting nothing but clean water out of it for the testing portion of this review. For the tests I did. I'm no laboratory by any means, but I have a couple tools that the average person doesn't have. I was able to test the water's PH as well as total dissolved solids in the water. Both these meters I use pretty much every day to test the water in my hydroponics veggie beds. Flow rate test. I did this by timing how long it would take to fill a 1 gallon jug. (N) - 60 seconds - So there was some slow down, which is to be expected since you now have a filter inline. I was really surprised though that the slow down wasn't really THAT noticeable just looking at the flow coming out of the tap. Next I tested the total dissolved solids (TDS) contained in the water. This means any minerals, salts and metals that are going to be floating around in your water. Unless you're using distilled water you're always going to have SOME dissolved solids. Dissolved solids are measured in parts per million, or PPM. The average PPM for drinking water in the US is around 350. Being here in California, having very hard water, and just the funky taste of the stuff coming out of our tap, I was surprised that it was as low as it was. (N) - 133ppm - A very slight decrease over regular tap water, but lower than the PUR. So I assume that the Nahla does a better job ensuring that the filter material stays in place. The third test I did was a PH test. I did this test using a calibrated electronic PH meter. I wasn't expecting any crazy swings in this just because of the water being filtered, but I got just a little bit of a surprise. Again, I live in Northern California where we have notoriously hard water. (N) 8.03 - While not as much of an increase, it's still an increase over the regular tap water. Last but not least I gave the three glasses of water to my wife to try. She's the reason I'm doing the whole water filtering thing in the first place. I did this taste test sort of like the Coke/Pepsi taste tests. I gave her three glasses and told her to rank them from best tasting to worst. After she tested and ranked them I then did some shuffling of the glasses and made her repeat the taste test. To me there was barely any difference between the PUR and the Nahla, but she ranked them the same all three times, which leads me to believe that there's something to it. Here's how she ranked them. Best - (P) - Yep, the PUR filter got her seal of approval. I was really hoping to be able to take that stupid hang on filter thing off by installing this Nahla filter, but I guess for now we're going to keep it. I may try to trick her in a couple of weeks by taking the cartridge out of the PUR and if she doesn't say anything, I'll tell her what I did. Anyway, there you have it. The longest friggen review I've ever written. Overall I like the filter. While my wife was able to tell a difference between the three types of water I had her try, I personally couldn't really tell the difference between the PUR filter and the Nahla. But I could hands down tell there was a huge improvement over straight tap water. Now I'm anxious to use the water from this filter on my hydroponics to see if it makes a difference in how my plants grow. I've actually been using 5 gallon jugs of bottled water to feed my plants because for some reason they would do horribly with some even dying if I used the tap water. I'll edit this review once I see how this water does with my plants. Great water filter system and easy install. Love it. No more chlorine smell or taste! After much research, we decided to go with this water filter system and so far are very happy. We looked at many including the reverse osmosis systems with pumps built in, and the biggest turnoff was the cost and water wasted with those systems. Installation for the Nahal system was easy and from start to finish was about 45 minutes which includes emptying out the cabinets and cleaning them. Note that they recommend no plumbers tape be used on the metal to metal connectors, only the metal to plastic ones. I had a slight leak the first day or so but kept adding a quarter turn until it stopped and now it is leak free and working well. Pressure is great and we cannot notice any change in pressure. I love the fact this filter is good for 3 years. I did not need any other parts for my installation. Everything fit perfect and no issues. Here on Long Island, NY, chlorine is added to our water system twice a day. At certain times, the smell and taste of chlorine is very evident. With this system, the smell and taste are gone. Even my wife commented on what a difference it has made. And my coffee tastes better too with my Keurig system which does not have a filter. I would highly recommend this for Nahla water filtration system for cleaner, better tasting water for your home. 93 of 108 people found the following review helpful. Why is almost every review written by people who have received a free or deeply discounted filter? This practice of paid reviews really makes me suspect and invalidates the entire review system. If you only look at the star rating you won't realize that these are paid reviews. The product may be great, but this deceitful practice harms the integrity of the customer review system.